I have to admit that I struggle with breakfast. I don’t have much of a sweet tooth at the best of times and in the morning I’m particularly uninterested in a high sugar meal. So a savory energy boost like these pide toasts is right up my alley on the early side of the day. I tend to buy pints of cherry tomatoes in pairs. One pint for my kids to consume right out of the carton and another pint to roast up and use in all sorts of yummy ways. When I’ve got roasted cherry tomatoes on hand, this is a delicious way to utilize them. Their sweet-tart flavor is the perfect complement to smoky paprika-flavored smashed avocado. I like to serve my tomato and avocado on Turkish pide toast, which my local supermarket just happens to carry. However, if you find it a little hard to come by, feel free to use this combo on your preferred toast type. It’s a satisfying way to start the day that should get you through to lunchtime with out your stomach rumbling for more. Place the tomatoes in a small rimmed baking tray and toss with the oil to coat. Season to taste with salt and pepper. Bake, uncovered, for about 15 minutes, until the tomatoes are soft and beginning to break down and crack open. Meanwhile, in a medium bowl, using a fork, smash the avocado flesh with the lime juice and paprika. The lime juice should be fully incorporated into the avocado but there should still be some chunky bits of avocado in the mix. Season to taste with salt and pepper. Toast the pide pieces until lightly browned. Top each piece with about 2 tablespoons of smashed avocado and about 6 cherry tomatoes. * Using the back of a spoon, lightly press down on each tomato to release their juices onto the avocado and serve. *The cherry tomatoes can be placed on these toasts right out of the oven or cold from the fridge. 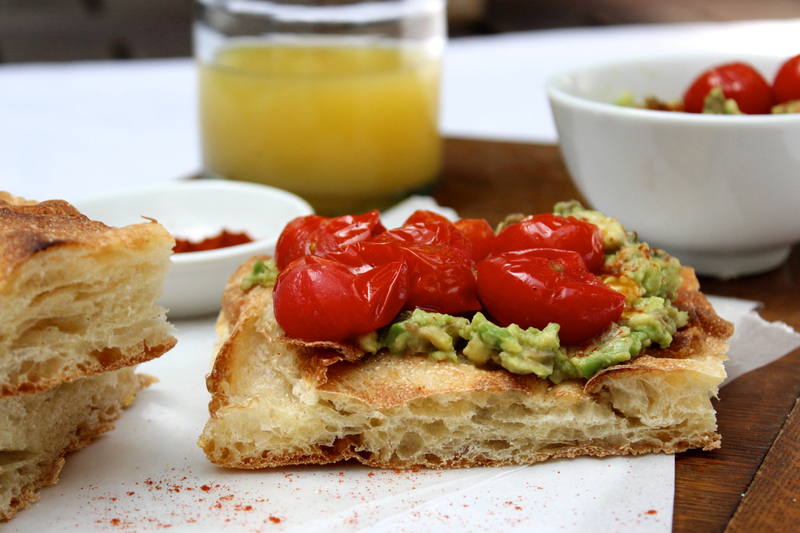 This entry was posted in appetizer, breakfast, lunch, side, snack, Uncategorized and tagged avocado, bread, breakfast, cherry tomato, pide, toast. Bookmark the permalink.